Yeah, that's me. About three-quarters of the way through my root canal yesterday. Last week, I was lying about, reading a book on my iPad and coping with one of those man colds. I was hacking my lungs up, blowing my nose to beat the band and cranking up the stereo because I was so stuffed up I was practically deaf (why's Mrs D always yelling at me?) when just when I thought I was a marvellous medical malady multi-tasker a tooth started to ache. It got worse Thursday but I didn't call the dentist. I have one of those love/hate relationships with my dentist. Usually hate wins out. Did I think my toothache would get better? Hey, miracles can happen. By Friday I was eating food the consistency of baby food and called the dentist. He doesn't work Fridays it turns out. He golfs. Lucky guy. But his colleague could take me, and did, and prescribed antibiotics until I could see my dentist Monday. Interesting weekend. More pablum-like food. Soup. Stuff that doesn't require chewing. Saw my dentist Monday. Didn't let on I hate him. It actually wasn't too bad. I debated whether I should have the tooth pulled or a root canal done. The latter won out. It only took an hour and-a-half. Now let me set the scene. The bad tooth was on the top of my mouth. So they tipped me back in the chair until I was almost standing on my head. Then they attached this rubber sheet around the tooth and away they went. Do you know what's it like to virtually stand on your head, keep your mouth open and drool for an hour and-a-half? No? I do. Now the idea behind a root canal is to drill a hole, remove the infection then cram a bunch of crap in the hole and cover it all up. This was a tiny tooth, not a big molar. But they sure jammed a lot of crap in that canal. 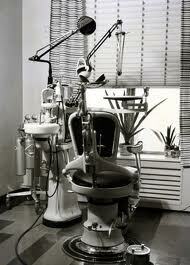 Dentistry has come a long way over the years. The novocaine needle was painless and the operation went off without a hitch. Man, when I was a kid I recall needles the size of darning needles and drills like jackhammers with the pulleys whirring away in front of me scaring me half to death. Why I hate dentists. Bad childhood memories. Thank goodness my dentist, who I've been seeing close to 30 years, doesn't live up to his name. What is it? Dr. Hacking. And I enjoyed his tooth-side manner so much I'm going back for part two of the procedure next week! Maybe you can photoshop in a Santa's hat and use that photo for your Christmas card this year! Great stuff! You act as though I'm enjoying this and want to relive the moment. No, he and the dental assistant kept going in and out either to take an x-ray or look after another patient. I snuck 2 shots while they were away. I thought "oh, I have to have a shot of this": I put it off and put it off and then finally went for it. By then I'd pretty much written this post in my head. who takes photos of themselves at the dentist, especially under such horrible circumstances? aaaackk~! Good grief! I hate anything dental related. That photo of you is funny AND upsetting. Sorry you have to go back next week for part two - but I am glad to hear it wasn't all that painful. I just wanted to share the experience with you. You might have thought I was making it up. Oh I absolutely hate going to the dentist. It always results in some amount of pain. This experience lived up to it's billing. I am proud of you. You made the right choice. I'm a total coward when it comes to the dentist. I really would prefer to be put to sleep under a general before I even open my mouth for a cleaning. Still, I do like having teeth. Take pain pills or drink whiskey. (Not both.) You'll get through this, Big Guy!! Have you ever thought of growing a green beard? This could be a great look for you. Good times! Good times! I have yet to experience the dreaded root canal, although I have a couple of crowns. My childhood dentist didn't believe in novocaine, so my early dental memories are even worse than yours. (I think the guy was a sadist.) Hope your pain is gone! You and me both. I once had some heavy-duty work done and they knocked me out. Best dental experience ever! Never felt a thing. I've had several root canals. I feel like I've gone to Venice without actually being there! I'm glad to hear that it wasn't too bad. I guess Cheryl calling you a sissy helped in your decision making? I feel for you, mon ami. 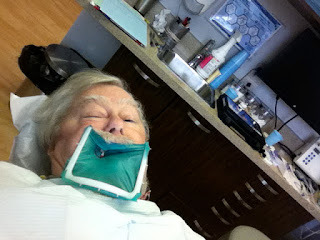 I am not a fan of dentistry either, even though my dentist is also an excellent dentist and a really funny guy. Hope part 2 is less upside-down and drooly than part 1. I tell ya the pain now after Part 1 is almost as bad as it was before. Excuse me while I pop another couple of Advils. Hahaha that's actually pretty funny. Can't believe you really did it. Anyway, it's a good experience to share with the world, even though people in here finds it disgusting, I myself as a dentista en zapopan find it kinda amusing. Hope to see more blogposts from you in the future. Regards! Hey, I'm a full service blog and am pleased to bring my pain and suffering to the masses.